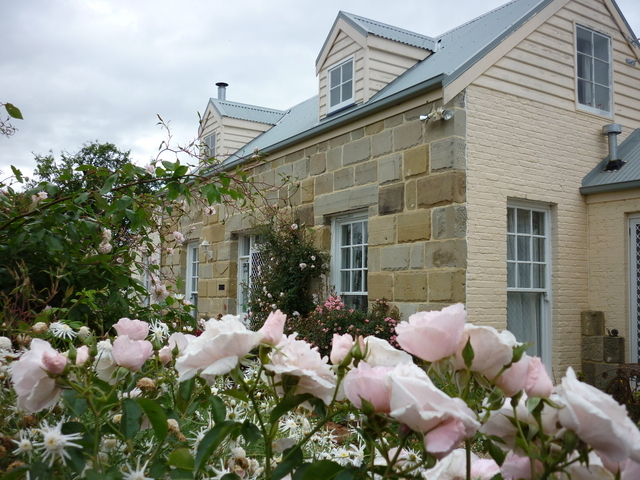 A stay at Mulberry Cottage B&B will give you a very different experience of Tasmanian history. Not only will you sleep behind the reclaimed procon walls but your stay includes discount to the award winning cultural heritage show in Grannie Rhodes Cottage on site, performed by your hostess. Accommodation is in themed ensuite rooms or a self-catering cottage. Unique accommodation. No where else will you find a B&B quite like this one with an award-winning Cultural Heritage show discounted when you stay here. In the historic Georgian village of Richmond, only a short walk from the oldest bridge in Australia and the village centre, but in a tranquil setting, off the main road. Hosted by actor/writer, Miriam Cooper your B&B is in the old world Mulberry Cottage which is built from the reclaimed wall of Hobart's Old Penitentiary or in en-suite private studios in the Garden Wing. Stay in the Old English Suite with four- poster King bed with en-suite and sitting room, or the Cheeky French Boudoir, with a special secret, or self-contained Christmas Cottage on site with all you need for longer stays. The 'Excellent- not to be missed' multi-award winning show is for the history lover but loved by everyone, your hostess entertains with a performance of 'Turn the Key of Time' the true story about a cottage, a key and a convict in Grannie Rhodes' Cottage, on site 1830 . Valley views. Rustic gardens.. Cuddly cat. A hostess with a wealth of local knowledge. Check In/Check Out : Check in strictly after 14.00 and before 18.00 Or contact the host. What to see & do : Richmond is Australia's loveliest Geogian village with the oldest bridge i Australia , the oldest Roman Catholic Church, the oldest complete gaol and many shops and boutiques. All in walking distance and only 20 minutes from the capital of this beautiful state of Tasmania. Nearby town(s) : Richmond 300m. Hobart 25km 20 minutes. Airport 15min. Take the turn to Campania in the Village - cottage is 300m on the left. please drive right up the driveway and check in at the main house.